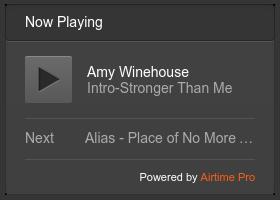 Airtime Radio - Your Internet Radio Station, 3 Months Free! A Special Limited-Time Offer to Celebrate Airtime's Exclusive New Home on the Web. 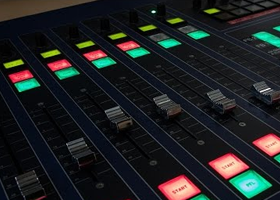 Airtime Pro has joined the European Broadcasting Union’s .Radio Pioneers program. .Radio pioneers are ambassadors for the newly-launched “.radio” top level domain (TLD). That means we are joining the EBU and the global radio community in the exploration of new digital radio territory. Only 80 organizations worldwide were chosen to be .Radio Pioneers and we are proud to be one of them. 1. Set up your free trial station (no credit card required). Your station will be ready to go in just a couple of minutes. 2. Once your station is set up, send an email to pioneers@airtime.pro with your name, the name of your station and URL, and the purpose you want to use your station for. That’s it! But don’t delay: this is a one-time offer. Make sure you claim your station while they last — sign up today! * This offer is only available to new subscribers of the Airtime Pro service signing up for a new station that meets the terms and conditions of the special .radio promotion. Get started now - you can be on air in under 5 minutes. This limited-time offer is a unique opportunity for you to try the state-of-the-art Airtime Pro internet radio broadcasting platform and start your own cloud-based Airtime Pro radio station for free. Ready to broadcast on the .radio? How will you make Airtime Pro your own? Broadcast, podcast or both? Use sophisticated automation tools or set things up yourself? Share and broadcast on social networks? DJ alone or with friends? Broadcast live or schedule programming months in advance? 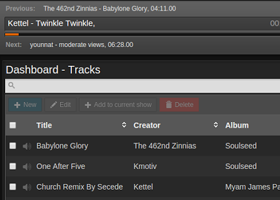 Set up advanced playlists, rotations, and auto DJ criteria? With Airtime Pro, it’s easy to decide - you're getting it all! 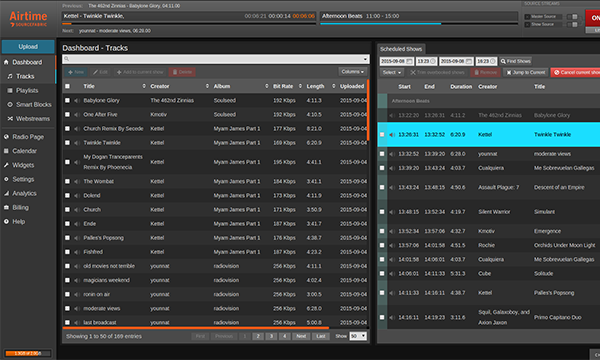 Plus enjoy a storage/bandwidth/listener ratio that’s unparalleled in the industry. Sign up today and start spinning your very own on-air success story with Airtime Pro. 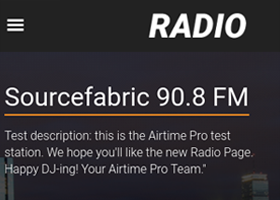 The new Radio Page is designed to meet Airtime Pro users’ needs, especially when it comes to making your programming more social, shareable and fun to use. Our intuitive design means just about anyone can quickly navigate the schedule. View it by week, month or day to focus in on the finer details of your programming. 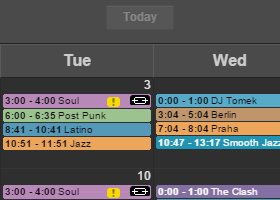 Additionally, our color coded shows let DJs find their content quickly. That means more time for planning quality content. 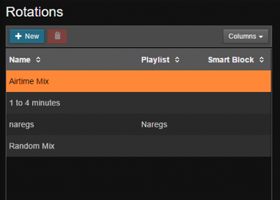 Audio files are your building blocks for playlists, and Airtime supports MP3, Ogg, WAV, FLAC and AAC formats. 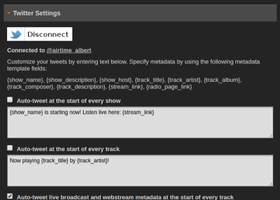 Simply drag and drop from the Airtime Media Library to create playlists from which to construct shows. 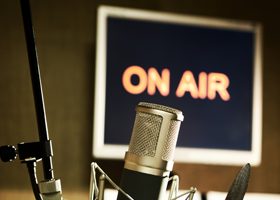 Podcasts are an essential channel for many radio stations due to their ability to reach offline listeners and offer a great solution for on-demand listening. To help you capitalize on that, we’ve built podcast hosting right into your Airtime Pro station so you can broadcast and podcast all in one place. How strong is your social media game? Whether you have an established presence on Facebook or are just getting started, adding the new Facebook player widget will take your page to the next level. The automatic show notifications option allows stations to let their Twitter fans know exactly when to tune in to listen to their favorite programming. Automatic track tweets let listeners know what’s playing and gives them a great idea of what type of content the current show features. 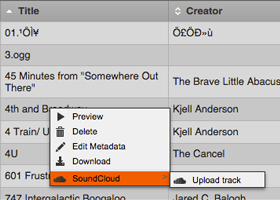 Airtime Pro now lets you upload tracks from your library directly to your station’s SoundCloud page. 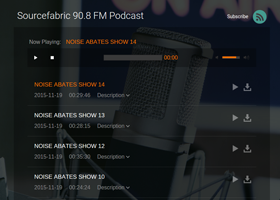 If you frequently broadcast full, pre-produced radio shows, this new feature can help you streamline your audio publishing workflow. 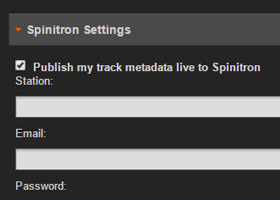 Spinitron does a great job of formatting and timestamping your playlists so that reports can be easily generated for compliance reporting or popularity statistics. Listeners can browse the Spinitron website to find your albums you’ve aired, your playlists and your radio station’s schedule. TuneIn is the most popular mobile radio app in the world, with a station directory of over 100,000 radio stations. 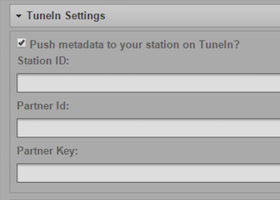 Listing your station on TuneIn is a great way to attract a global audience on mobile devices, and Airtime Pro can now automatically update the artist name and track title metadata for your station on TuneIn so that listeners will see it in real time. 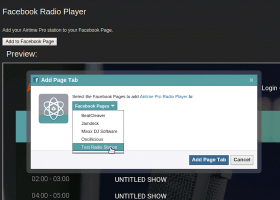 This feature allows you to easily embed your Airtime Pro station on any website with just one line of HTML code. Among the many thing radio makers can do with Airtime Pro is switch seamlessly between scheduled playout and a live DJ stream. You can use software running on SHOUTcast or directly stream using Icecast to Airtime. A big part of running a great radio station is knowing your listeners. 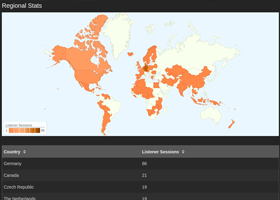 To help you with that, we’re pleased to unveil a revamped listener statistics page for Airtime Pro that shows where your listeners are, how long they’re listening for, and what they’re listening to. With Airtime Pro, getting a radio station together in terms of content and broadcast might not be as hard as you think. Brilliant! Simply Brilliant! I love everything that I'm able to do on Airtime Pro, starting my own internet radio station was quick and easy, and with a handy tutorial on how to schedule shows and manage tracks, I was able to start broadcasting a nice selection of music in no time! Thanks Airtime Pro! Airtime Pro is stable, easy to learn, and easy to use. It makes our station management easier. If you want great broadcasting, I recommend Airtime Pro. I am having the time of my life using Airtime Pro!!! It is easy to use!!! The quality is everything!!! Truly, it's a dream come true that a tool like this exists!!! God bless you!! !